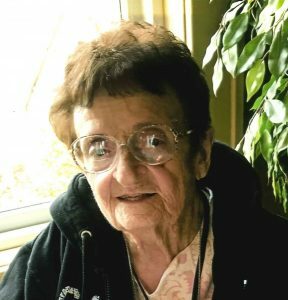 Greta Chleboun, 84, of Columbus, died Sunday, December 17, 2017 at the Columbus Community Hospital. Funeral Service Wednesday, December 20,2017 10:30 A.M.
Visitation Tuesday 5-7 P.M. Peace Lutheran Wednesday 9:30-10:30 A.M.
Committal in the Clarkson Cemetery-1:30 P.M.
Greta Lea Kumpf was born November 5, 1933 at home in Leigh, NE to George and Margaretha (Rabeler) Kumpf. She was baptized and confirmed at Zion Lutheran Church, Leigh. She graduated from Leigh High School in 1950. After graduation she attended Midland College in Fremont from 1950 to 1952. She graduated from the University of Nebraska College of Nursing in Omaha as a Registered Nurse with a Bachelor of Science in Nursing in 1955. Greta and John Koopman were married in 1955 and they raised three children. On September 10, 1976 she married Don Chleboun. He died on October 21, 2000. Greta and Don owned and operated Stockman’s Bar in Clarkson for many years. She was a member of Peace Lutheran Church in Columbus, lifetime member of the University of Nebraska Alumni Association, past president District II of Nebraska organization of Nurses Executives. She received the Leadership Award from this organization in 1994. Greta retired in 1995 as Director of Nursing Service from the Schuyler Hospital after 23 years of employment. She then worked part time at Colonial Manor in Clarkson and taught Nurses Aide classes at Central Community College in Columbus. Greta enjoyed fishing in Minnesota with the grandchildren, crocheting, embroidering, reading, dancing, Big Band Music and 50’s music. She also loved her summers in Minnesota and especially loved the call of the loons over the Northern Minnesota lakes. She was preceded in death by her husband, parents, grandparents, brother, Tom Kumpf and an infant son. She is survived by son, John David (Isabel) Koopman of Omaha; daughter, Linda (Albin) Moore of Columbus and Joan (Bill) Kreifels of Nebraska City; stepson, Jeff (Joyce) Chleboun of Missouri Valley, IA; sister-in-law, Theresa Kumpf of Columbus and special friend, Frank J. Vrba and many nieces and nephews. Also surviving are grandchildren, Jessica Moore, Jaimie Medlin, Allison Weddle, Dr. Will Kreifels, Jordi Koopman, Jenni Soukup and Amy Kreko; great-grandchildren Tessa Weddle, Madison Weddle, Levi Weddle and Layton Weddle, Charlotte Soukup, Jaxson Medlin and Savannah Soukup. Pallbearers: Dr. Rex Kumpf, Bret Kumpf, Dr. Will Kreifels, Jordi Koopman, Christopher Weddle and Jake Medlin. Honorary pallbearers: Dr. John O’Neal, Frank J. Vrba, Ernie Spanhake, Tonya Evans, Ken and Deb Karel, Glenda Steinsberger, Alice Plettner, Dr. Merlin Sucha, Ruth Waters, Sandy Blum, Jaimie Medlin, Jessica Moore, Allison Weddle, Jenni Soukup and Amy Kreko.